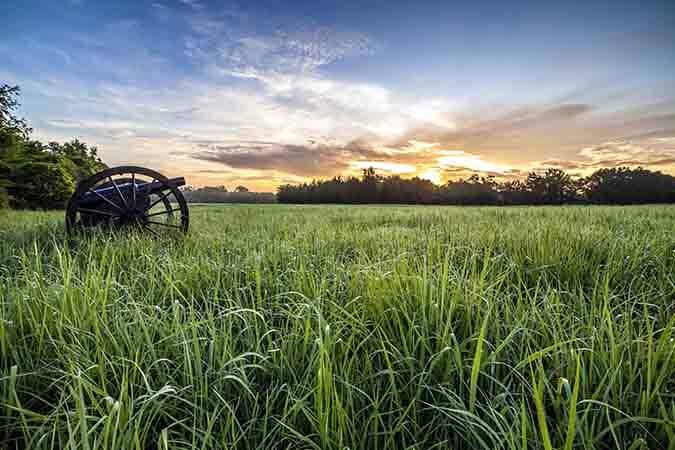 WASHINGTON – The National Park Service today announced $166,360 in grants from the American Battlefield Protection Program (ABPP) to help protect 51 acres of Civil War battlefields in North Carolina threatened with damage or destruction by urban and suburban development. The grant will be used to acquire portions of the Averasborough and Bentonville Battlefields, which are both significant Civil War Battlefields. The Battle of Averasborough occurred on March 16, 1865 and was the prelude to the climactic Battle of Bentonville, the other North Carolina recipient of a Battlefield Land Acquisition Grant. At the Battle of Averasborough, Confederate forces under General Hardee slowed the advance of a portion of Union Major General William T. Sherman’s army north from Fayetteville. This action enabled Confederate General Joseph E. Johnston to amass a larger force at Bentonville. The Battle of Bentonville, the last battle between the armies of Sherman and Johnston, occurred from March 19-21, 1865 and resulted in Johnston’s surrender almost a month later on April 26 at Bennett Place near present day Durham, N.C. The Battlefield Land Acquisition Grant Program is administered by the ABPP, one of more than a dozen programs operated by the National Park Service that provide states and local communities technical assistance, recognition, and funding to help preserve their own history and create close-to-home recreation opportunities. Consideration for the battlefield land acquisition grants is given to battlefields listed in the National Park Service’s Civil War Sites Advisory Commission’s 1993 “Report on the Nation’s Civil War Battlefields” and the ABPP’s 2007 “Report to Congress on the Historic Preservation of Revolutionary War and War of 1812 Sites in the United States”. Grants are awarded to units of state and local governments for the fee simple acquisition of land, or for the non-federal acquisition of permanent, protective interests in land easements. Private non-profit groups may apply in partnership with state or local government sponsors. The grants are funded from the Land and Water Conservation Fund (LWCF), which uses revenue from federal oil and gas leases on the Outer Continental Shelf to purchase land, water and wetlands for the benefit of all Americans. Since its establishment in 1964, LWCF has conserved land in every state and supported tens of thousands of state and local projects, including the protection of important water sources, expansion of access for hunting and fishing, preservation of historic battlefields, and creation of ball fields and recreational areas. For more information about ABPP, including these grants, please visit: www.nps.gov.